Are you looking for unique homeschool schedules that will work for your family? 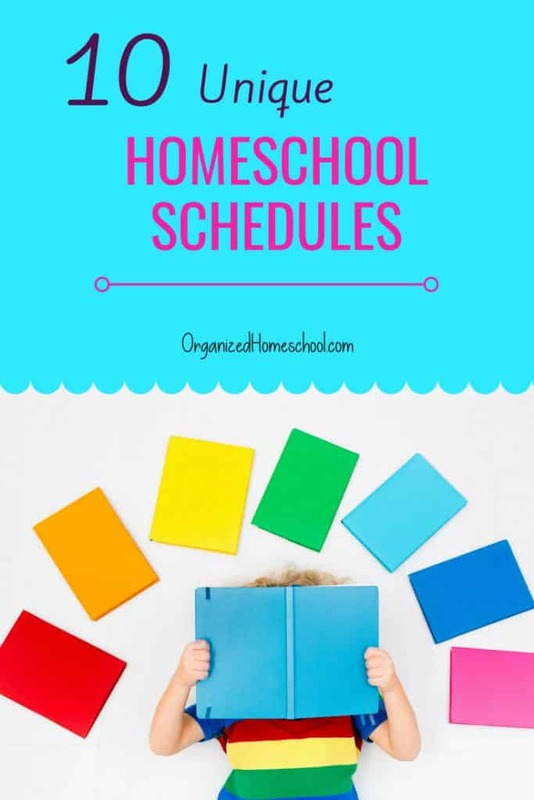 You know you need a solid schedule to get everything done for your homeschool and keep your home and family life in check, but do you need some fresh ideas to help you? 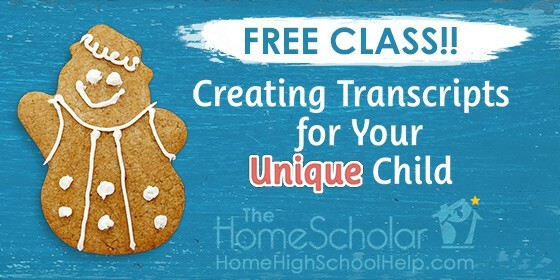 The solution to getting it all done is to establish a unique homeschool schedule so that everyone in the family knows what is expected and when it will all take place. We have compiled a list of 10 unique homeschool schedules to help you. This will give you an inside glimpse into what works for others. Use these ideas to glean from them what will work for you as you create your own homeschool schedule. She has a general plan of what to accomplish during the week between the hours of 7 and 4 pm in spite of everything not always running like clockwork. Intertwined throughout the day she reads to her little ones and also reads history and literature read alouds to her older children. She doesn’t stick to a strict schedule in 30 minute time blocks, but instead, lets the day flow from one task to another until her husband comes home from work at 4pm. She also finds time to blog on another website, Life As Mom, which has more unique homeschool schedules. Great to have you! Now be sure to check your email to download your calendar. Pam at Ed Snapshots homeschools her three young children. Her unique homeschool schedule type is mainly Classical with a bit of Charlotte Mason. She points out the importance of your morning homeschool routine. The best way to accomplish your morning homeschool routine is to start preparations a day ahead so that everything for school is lined up and ready to take action for the following morning. She utilizes what she calls the clipboard checklist. Each child has a clipboard with a weekly checklist of homeschool work to be done, copywork sheets, any worksheets from their curriculum that can be torn out, and any other work in progress that needs to be finished. She prepares the clipboards each day after homeschooling is done so that they are ready for the children to complete the following day. Another interesting and extremely useful idea she has is to set an evening alarm in order to get yourself to bed on time. She tries to get in bed by 11pm so that she can wake up at 5:30 before the kids wake up. Using mornings wisely so that you are ready before the children are getting ready can make all the difference. She also advocates morning chores before beginning independent schoolwork. With mornings that run smoothly, it hopefully paves the way to a great day. I love her 4x6-inch flip-style photo album with routine cards for each day. She usually does homeschooling daily from 9 a.m. – 1 p.m. Other times for chores and errands outside the home. She made a list of all the chores, errands, and other weekly tasks that needed to be done and then simply assigned each item a day of the week. 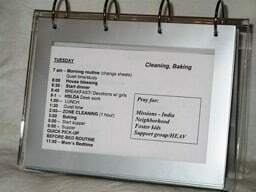 She then prints her schedule for each day on a 4x6 inch piece of card stock and slips it into the photo album and simply follows the plan for each day. Heather at The Pioneer Woman homeschools her three children. She loves structure and plans her routine in 15 or 30-minute increments, prints them for the kids’ work binders, and interestingly enough gets everything done for homeschooling in a 4-day week (Monday-Thursday). Run around like a chicken with my head cut off. Hopefully your own routine isn’t as relaxed as this!!! Jill at Well-Trained Mind homeschools her four children. If you struggle with ‘scheduling’, try routines instead. Lisa at Lisa Jackson Design homeschools her six children, which appear to be grades K thru 7th in 2015. She considers herself an eclectic homeschool mom, using: religious, unschooling, iPad learning, school at home, TJEd & co-ops/field trips, and Montessori. My two favorite unique homeschool schedule ideas from her are she schedules in three different times for recess, and also schedules one on one time with each child! An example is shown below, and more info is available on her website. Crystal at Serving Joyfully homeschools her boys. Her type of homeschooling is what she describes as eclectic and laid back, utilizing unit studies, unschooling, and Charlotte Mason. She does like routines to provide structure as well as allow flexibility with accountability. She schedules items in general and lists whether to do them in morning, afternoon or evening. Charlotte at Hip Homeschool Moms has been homeschooling her 12 children for over 28 years. She has graduated at least 7 of her children so far and has plenty of experience. She prefers to not keep a rigid schedule and has learned that moms are better off not letting what other families do influence personal self-worth. It is better to do what is best for your family. This idea of routine, not schedule, has helped Charlotte to continue homeschooling in spite of health issues. She likes to do things in a certain predictable order, not necessarily tied to the clock. Check out her website and see what a typical homeschool day is like for Charlotte. What worked for her, may work for you! Mary at Owl Haven has been homeschooling her 10 children, four plus six adopted, for many years. Homeschooling in their home is scheduled, but not strictly adhered to as flexibility is needed. 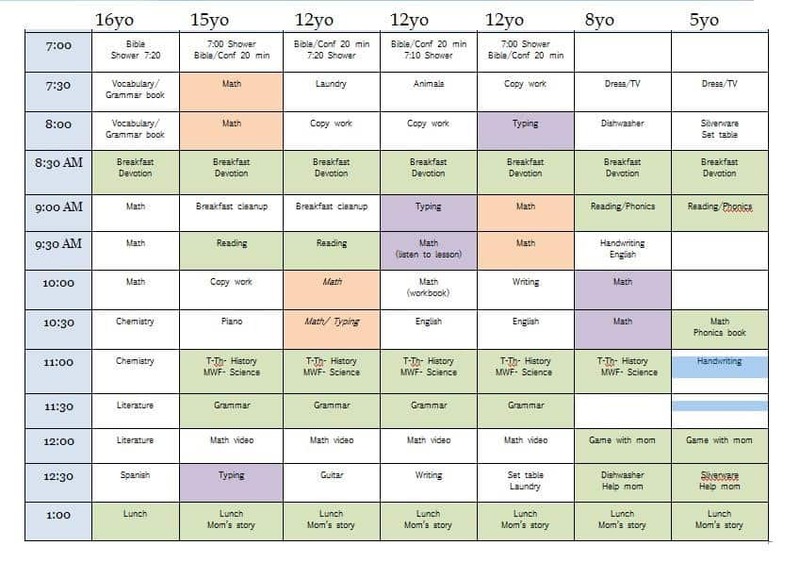 This chart is an example of one time period where she was homeschooling 7 children ranging from 5 to 16 years of age. What a unique homeschool schedule! Notice how she scheduled each child’s activities to allow for various children to rotate using two computers (marked peach and purple). Green indicates subjects she teaches directly. Find out more at her website. If you have multiple children to homeschool at once, I’m sure you’ll find many resources there that may assist you with ideas as you create your own homeschool routines. My own family has 2 children. I’ve homeschooled for over 13 years. Our routine has changed drastically based on the many areas we’ve lived in, the activities we’ve been a part of, and the ages and interests of family members. To deal with the changing routines, I like to start by putting everything that we’ll be doing onto a weekly time-schedule calendar with times listed from 6 am to 9 pm in 30 minute increments. This shows our routine for the whole year as I do not change it each week, rather it just shows our schedule for an entire week. In an Excel spreadsheet, simply list the times down the left hand column (6:00 am – 6:30 am, etc.) and the days (Monday thru Friday) across the top. First, fill in activities that occur at a specific time each and every week outside of the home (label who the activity is for). Highlight anything that takes place outside the home, including driving time, with a gray background from start time to end time. Next, fill in your family’s essential routine items. These include meals, chores, bath/shower and getting ready for the day, devotional/religious study, a family night where you don’t let outside activities interfere with your family time, grocery/shopping trips, and essential breaks for play or quiet relaxation. All planning up to this point should cover everything except curriculum and should be applicable to the entire family. Make sure that you’ve allowed enough blank space on your calendar to allow for adequate school hours and time to be flexible as things come up in your week. Save your work at this point. From here on, you’ll be using the available blank time slots to custom-tailor each of your child’s schedules based on their curriculum and age. It’s helpful to consider which subjects each child will need more parental help with so that you can arrange to have other children work on something at the same time that they can accomplish with little guidance or completely on their own. This allows you to arrange each child’s schedule so that everyone knows what needs to be done, and when/where you’ll be going out for activities. Once each child’s calendar is filled, you’ll save it with the child’s name at the end of the file name. Example: 2015-2016 School Routine (Child’s Name). Place a chore chart next to the individual schedules and post everything up on the fridge. Also print a copy of each child’s schedule to place on their desk or in their school binder. Voila! Now all you have to do is follow along. We never follow this routine exactly to the minute, and we always feel free to improvise based on how our day is going. Some things are easy to skip, replace, or leave out, while others are decidedly set in stone. The point is to have it written so you know what you’ve got “on your plate” and don’t forget anything. I’ve discovered that by planning in this way, and not just what classes to do when, you cover all your bases that pertain to family life and the whole family is part of the routine. Now that you’ve checked out many styles and unique homeschool schedules, put together a simple version of what your first impressions are for your family’s ideal routine. Add to it and make changes as you go along. As you do, you’ll discover what works best for you and you’ll feel better knowing your routine will become just that, ROUTINE, in no time. Thanks for your referral to my blog. I will have to give you one back in a post! Oh, that is z funny schedule. I do remember that. I think we actually did id a couple days out of one week, it was too hard, and I stopped. This is our routine for this summer. I have not really gotten all of it done in any one day yet, but it is just a guideline. I really just go with the flow. Every day is completely unique in reality. No two days are even close to being alike! I also want you to know I change our routine whenever I get a whim. It could be every day or once a week. I am so funny. My kids tease me about it. I think it is really funny that there may be people online that think I do one one one with every child every day. I only have 6 kids. If there were 7 names, then one was my husband’s, likely.. I do not do one on one with each child every day. I do one on one with each child about 3 times a week. That is something at least. There are many times when it is me with half the kids and my husband with half the kids, for summer ball games now. Thank you so much Lisa for sharing your new homeschool schedule. 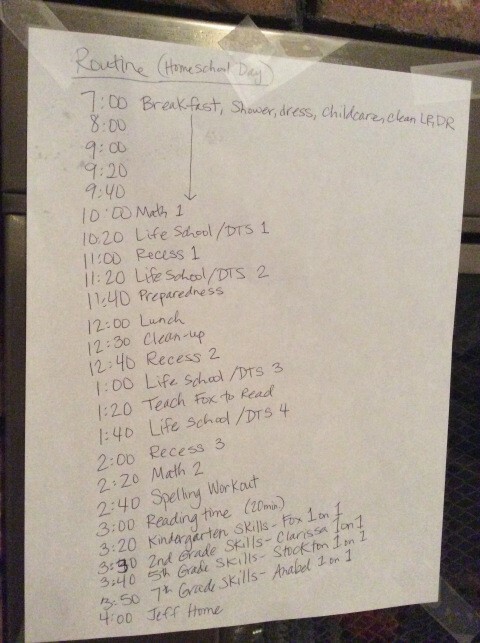 I love learning how other homeschoolers plan their days. And yes, it is a constantly changing schedule in each season of life.